this season with their new range of fabrics, cushions, bedding and lampshades. ‘Wisteria’ is the hero floral, while the pastel pattern of ‘Lola’ is reminiscent of movement and reflections of slow-moving water in the Scottish countryside. E L L A D O R AN has launched five new wallpapers inspired by textures and the patina created by time and use on everyday surfaces. Her Peeling Paint design combines a distressed print with a warm colour palette. AN NY W H O is a conceptual lifestyle brand founded in 2013, with eco-friendly materials and sustainable products at the forefront. We adore the bold prints featured on their cushions, postcards, prints and kids clothes, especially this Monstera canvas cushion made from 100% cotton. M I N O R G O O DS believe in simple design and beautiful craftsmanship. They make and curate timeless lifestyle accessories that will stand the test of time. As well as stunning stoneware, their new denim range includes this ever-useful bag with vegetable-tanned leather handles. T H AN DA founder, Suganya Smith, specialises in sourcing ethically made homeware products from South Africa. The range includes bold geometric wicker baskets, pretty porcelain bowls, printed tote bags, distressed style frames and beautiful mohair throws. illustration and now adorns ceramics with her whimsical and charming drawings. Her inspiration stems from her childhood in the Yorkshire countryside surrounded by animals and nature. The collection is handdecorated in Stoke on Trent. PAR K WO O D P OT T E RY is a self-funded project established in 2007 by Graeme McKenna and Inga Heppleston. In conjunction with Lane by Post, they have produced a collection of hand-glazed mugs, which causes a natural variation in colour and shape with a handmade matte finish. ROS S & B ROW N offer the best in Scandinavian homeware both online and in their store in Cheam, Surrey. With the botanical trend in full swing, their Limited Edition Botanic Urban series of unframed watercolour art prints by artist M.Koster is spot on. ‘The Cockpit Arts community was really welcoming and didn ’t mind sharing manufacturer contacts, ’ explains Sian. ‘We got lots of helpful advice!’ Tucked away behind Deptford High Street, Cockpit Arts is a creative hub that is home to a host of designer-makers creating everything from musical instruments and lampshades to jewellery and textiles. 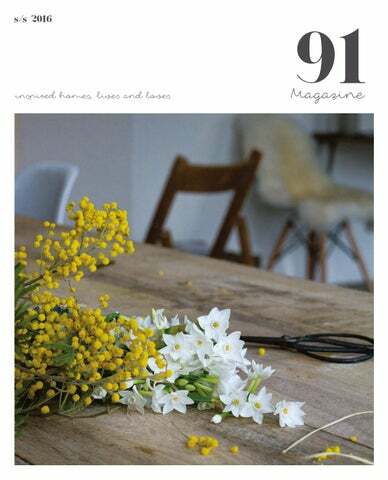 It is here that homewares designer Sian Zeng is based. Sian Zeng’s start in the world of interiors was a baptism of fire. The woodland-inspired magnetic wallpaper she created for her final-year degree show at Central Saint Martins caught the eye of an interior designer who ordered several rolls to decorate the nursery of Hollywood actress Hilary Duff. The investment helped Sian get the wallpaper, then just a prototype, into production. The unique wallpaper, which sees magnetic dinosaurs and hedgehogs (amongst other things) move across an intricately illustrated landscape thanks to a specially-designed magnetic backing, is now a signature product stocked in more than 21 countries. Sian’s collection has now grown to include bedlinen and cushions based on her playful illustrations. She’s also very excited about an upcoming print collaboration with a British furniture retailer. ‘I’ve always been interested in interior design,’ Sian says. ‘I spent a large portion of my pocket money on miniatures for my doll’s house, and the first time I read Elle Decoration as a teenager I was well and truly hooked.’ A resident of Cockpit Arts for over five years, Sian followed a paper trail of designers she admired before visiting the studios’ open house event. ‘I found the Cockpit designer-makers very friendly and, most importantly, the studios have central heating!’ she describes. ‘After having spent half a year in an artist’s studio with no heating and concrete flooring, heating was a major plus for me.’ Not just a space to work and store products, Cockpit Arts has become a valuable tool in growing the Sian Zeng brand. ‘The Cockpit Arts community was really welcoming and didn’t mind sharing manufacturer contacts,’ explains Sian. ‘We got lots of helpful advice!’ Alongside neighbours Lush Designs and Eleanor Pritchard - her tutor from CSM - Sian has created a base a mere 10 minutes away from the distractions of home life, where she can balance the admin and processing aspects of her business with the creative designing of her collections. Bedminster, a vibrant and independent quarter of Bristol, England, is the place which freelance writer and blogger Lou Archell and her partner Dan Taylor have happily called home for ten years. It wasn’t exactly love at first sight, in fact it was the ugliest house on the street, ‘it was cold and damp- I cried when we bought it!’ says Lou. ‘Inside the house was a DIY disaster with purple gloss paint on the walls, wood chip ceilings and a pale yellow mouldy bathroom.’ However, a decade on and the couple have since had two children, Charlie and Rufus, and the family have now renovated every room – the purple paint is now, happily, a distant memory. Making a Home A home with a rich history, the Victorian terrace was built in the 1840s by wealthy tobacco owners for their workers. Whilst the home has retained much of its original layout, the couple did task a builder with knocking through the dining room and kitchen to open up the space downstairs. ‘The kitchen-dining room is the hub of our family,’ explains Lou. ‘We congregate around the table, which is used for homework, playing and eating.’ The dining room is home to a wall of striking William Morris wallpaper, which brings a wonderful sense of life and character to the space, and creates a picture perfect setting when reflected back in the mirror on the opposite wall. Lou and Dan also converted the loft into a bedroom and so this previous two-up, two-down home is now a three-bedroom house with much more space. Tell us a bit about how O’Dell’s came to be… I had worked in menswear shops since the age of 14 and I knew that one day I would have my own store. After ten years of working within the menswear industry in London, I decided it was time to go for it. The opportunity came up and, within two days, I had made my mind up. Ten days later, I was in and the shop was open. I love meeting customers, working with talented people, and the lifestyle having my own shop has given me. You carry goods made as locally as Shoreditch along with those from faraway places like the USA. How do you decide which products to stock and where to source them? I always say that everything in the store I would wear, read, have in my house or give as a gift. Each item I feel passionate about. Each item has a great story behind it and a lovely quality to it. This is the O’Dell’s ethos. Shoppers looking for a little direction can check your weekly top picks online. What is your all-time favourite product from your shop? I’d have to say Rachel Scott’s rugs, hand woven by Rachel from her house in Pimlico. Each one is unique, made from 100% British wool, and takes Rachel over 70 hours to make. They are really beautiful and will last you a lifetime. I found these before I had the shop and always wanted one in my home, and now I have them for sale in the shop and on the floors of my Camberwell home. Rachel is a wonderful lady. I try to pop round to her house every few months to pick up new rugs and have a chat. Out of interior, lifestyle, and menswear, which line seems to be most popular with your customers and why do you think that is? Do you see that changing over time? I’d say I’ve got the balance just about right with no one category dominating the others. They sit nicely side by side. Moving forward, I’d love to do more menswear and a larger range of homewares but there is no rush. Visitors to the shop are welcomed by a handsome, stylish interior. What were you aiming to create when designing the space and choosing the décor? A simple design that wasn’t too trenddriven. The shop is my taste and pretty much reflects what I have at home. I wanted to display each product equally. I’m not under pressure, like the bigger stores, to sell more of one item. How does the vibe of your creative Shoreditch surroundings affect the way you operate O’Dell’s? I’m lucky to be on a beautiful street, which has a lovely feel about it. The surrounding shops are also great and I’ve made friends with a lot of local shopkeepers. The location of the shop is perfect. Not only do I get great, regular customers in the store, but I also get lots of local residents and tourists popping in, many of whom have been staying at Ace Hotel or have had meetings at Shoreditch House. Instagram followers of @odellsstore aren’t lacking for eye candy. In what ways do you primarily use social media sites like Instagram and Twitter? Do you find that your followers help to shape your business decisions? I’m a visual person, and I hope the shop reflects this. Instagram allows me to reach a global audience and hopefully gives people who shop online or live outside of London an idea of what the shop is like. It’s a lovely way to show off all my talented brands and makers. Being an independent shopkeeper also allows me to be reactive. I get lots of customers coming in asking for products I don’t have. If I can, I try and get these in or suggest where they could go to purchase them. You’ve recently partnered with the nearby Town Hall Hotel to set up shop on their premises. What are you hoping to achieve as a result of this collaboration? Any other exciting projects on the horizon? The Town Hall is a wonderful place, a relaxed hotel setting, and a venue where I can introduce my wares to new clientele. I know that, as a tourist, I like to find new products that I can’t get in my own country, and the O’Dell’s shop at the Town Hall Hotel allows people to purchase a carefully selected range of items from London. The Coco & Wolf with Little B collaboration creates luxury yet affordable and stylish children’s homewares, all centred around beautiful Liberty prints. Lovely little things for your lovely little things. Brighten up your workspace with Fox and Star’s stylish stationery. Our online shop is packed with cute planners, vibrant washi tapes and beautiful stationery from around the globe. Beautiful gifts and accessories for the home, all proudly designed and made in the UK. Treat yourself and enjoy 20% off your first purchase using code SPRING91. Plants you can’t kill? Perfect! The Cactus & Succulent collection from Finest Imaginary means even those without a single green finger can keep their plants thriving! Gorgeous floral and fauna designs transferred to vintage plates & ceramics. Handmade botanical stationery & home decor all handcrafted by independent maker and designer Lisa Rushton. Le Petit Jardin is the destination for your al fresco life, this season and beyond. A curated range of vibrant Fermob garden furniture, lighting, enamelware and cosy blankets for those campfire evenings. Live plein air!! Design-led gifts for little ones, Mamas and happy homes. Find us on Instagram at @littlemaldod Enjoy 10% off all orders with ‘91maldod’ until July 31st 2016. Mabel & Rose source original vintage accessories with a particular emphasis on helping you to create beautiful outdoor spaces. We also offer a vintage hire service for weddings and events. From a range of planners and origami notepaper to tableware made from finest bone china - Lollipop’s products nudge you to open, fold, organise, play, treasure and smile. Working from their Derbyshire based workshop, SAIL craft timeless products for both men and women. Working with only the finest vegetable tanned leathers and materials, they pride themselves in still using traditional methods and techniques creating every piece by hand. Lolly & Boo offer a wide range of country-inspired handmade drum lampshades using the finest British linens, specialising particularly in Peony & Sage fabrics. We also sell linen offcuts. Winter’s Moon offers a quirky colourful mix of vintage and modern homewares. The collection is available online or by appointment at their Chichester studio and includes furniture, lamps, shades and textiles. 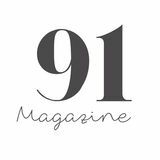 In between issues you can keep in touch with 91 Magazine via our blog and social media pages. We share inspiration for your home and life on the blog a few times a week, we love to pin on Pinterest and are always chatting to our readers on Instagram, Facebook and Twitter. Do stop by and say hi!